Six of our long stem yellow roses and featuring white dendrobium orchids arranged in a hour glass shaped glass vase with lush greens and a yellow ribbon designed one sided. Available for pickup at our store in Santa Ana or delivery to all cities located in Orange County California by Everyday Flowers. 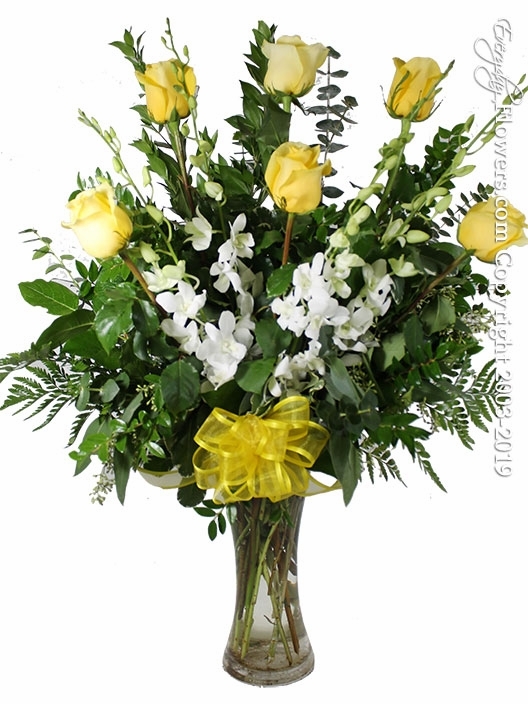 Arrives arranged with 6 Long Stem Ecuadorian Yellow Roses, 4 Stems of White Dendrobium Orchids, Lush Greens, Hour Glass Shaped Vase and Yellow Ribbon.